The CBC's Quickstart Your Kayak course is perfect if you are a novice who is interested in finding out what sea kayaking is all about! 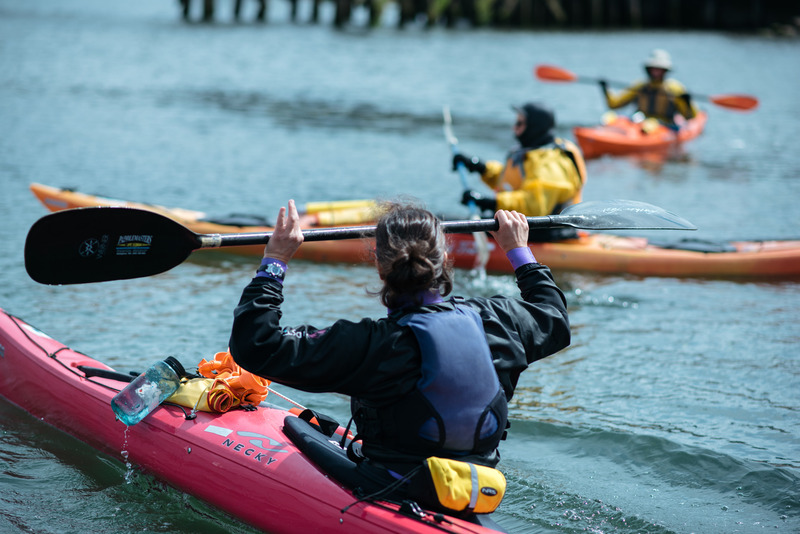 During this course, students will learn the basics of sea kayaking, such as paddle strokes, terminology, basic maneuvers, and cold water safety. You will also get to experience beautiful Bellingham Bay from the water and enjoy the marine environment. 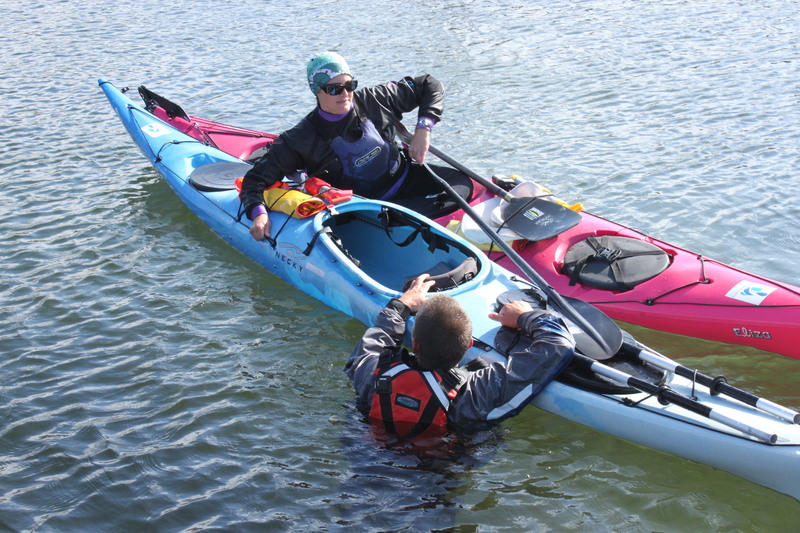 If you like this course, you're bound to love our Introduction to Sea Kayak: ACA Level I & II course. This 6-hour course is designed as a short program emphasizing safety, enjoyment and skill acquisition for beginning paddlers. Skills transfer to any type of kayak including traditional decked kayaks (sea kayaks), inflatables and sit-on tops in calm, flat water, protected from wind, waves and outside boat traffic, with no apparent current and within swimming distance of shore. Exiting a sea kayak while wearing a spray skirt will be taught. Re-entering a kayak (self -rescue) after a capsize will be demonstrated by the instructor but not required of students. Additionally, students have the opportunity to form connections with their classmates, leading to paddle buddies for future adventures after class. CBC is able to provide sit-on-top kayaks, but if students would like to bring their own, they will receive a $15 discount off the final price of the course. Note: Wet exit and self-recovery methods are required skills to rent sea kayaks from the CBC. Our Essentials of Sea Kayak Touring: ACA Level II course is offered in two formats: three 3-hour sessions, or two 4.5 hour sessions. Both sessions cover the same material, and total nine hours of instruction. This class is ideal for novices, or paddlers who may have spent time on the water but have not had a technical introduction to paddling fundamentals. 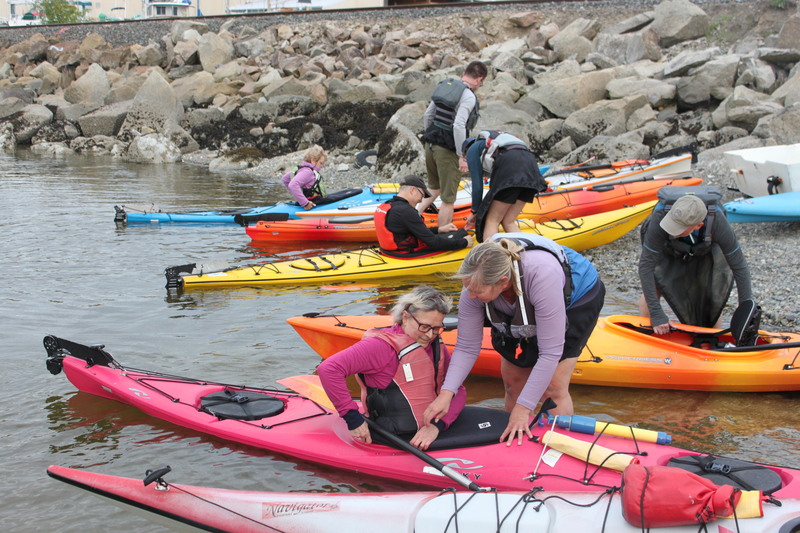 Students learn parts of a kayak, necessary safety gear for sea kayaking and how to use that gear, how to steer the boat through edging, rudder steering, & strokes, wet exits, solo deep-water reentries, and assisted deep-water reentries. 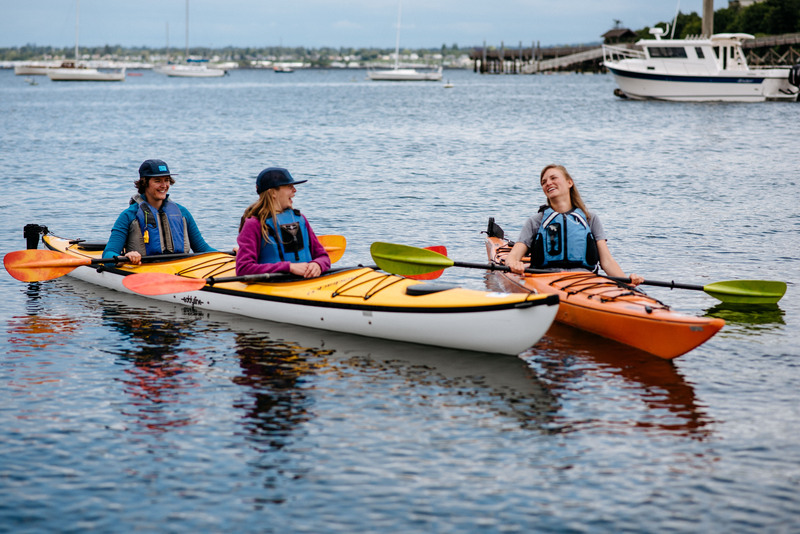 Additionally, students have the opportunity to form connections with their classmates, leading to paddling buddies for future adventures after class. 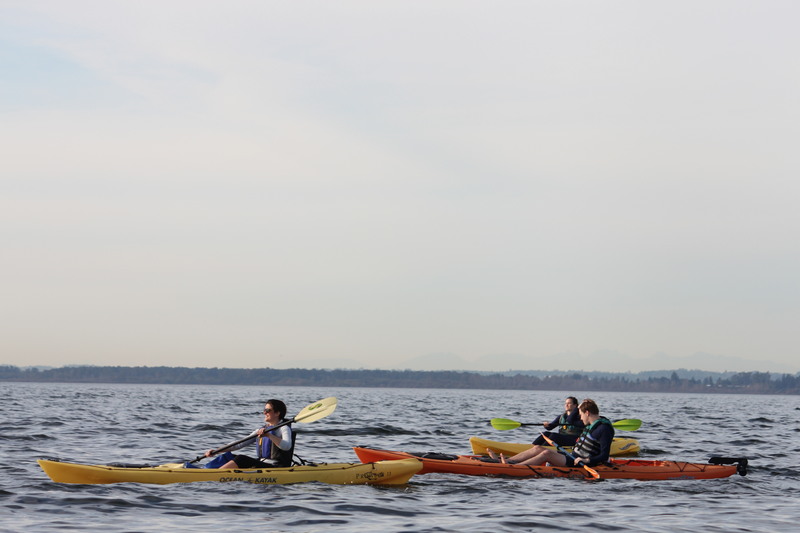 This class also qualifies you for sea kayak rentals! Because wet exits and self recoveries are covered in this course, by passing this course *students are qualified to rent CBC sea kayaks. Instructor to student ratio is 1:4. Depending on the number of registrants, either one or two instructors will teach the course. *To rent CBC sea kayaks, an individual must have prior experience with wet exits and self recoveries, either personal, or through the CBC's Wet Exit and Self Recovery course, or this Intro to Sea Kayak Touring course. Have you been out sea kayaking and didn't realize there is safety training needed? Or has is just been a while since you have practiced doing a wet exit and recovery? Or are you interested in renting our sea kayaks but have never done a wet exit or recovery? This course is designed to get you quickly out on the water practicing wet exits, and reentries. You will learn how to slow down and think through the steps, disengage your sprayskirt, and to get out of the boat to then begin the reentry. You will practice several methods of reentering your kayak including using a paddle float, cowboy method, and assisted. We provide you with all the gear needed including a wetsuit and spray jacket to keep you warm. If you would like to use your own boat that is okay too. 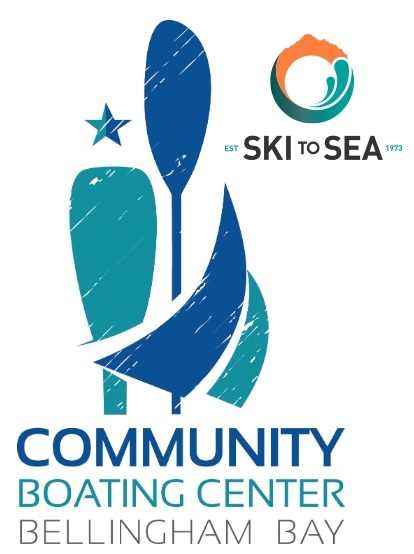 Learn more about Ski to Sea rentals! Prepare for the Ski to Sea kayak leg through our Race Prep & Safety course. This course provides participants with the basic safety skills needed to recover themselves and their boat from a capsize in deep water. The class covers wet exit and self recovery technique (no rolling techniques are covered as this class is only intended for beginners or as a refresher), basic cold-water safety knowledge, paddling techniques and tips, quick launching, and discussion of the Ski to Sea race course (both long and short courses). Included in the price of the class are three 1-hour kayak rental vouchers for use for class participants who would like to practice prior to the race on May 26th. Enjoy a customized lesson to fit your needs. Private lessons are a great way to enhance your kayaking skills and enjoy one-on-one instruction. Our private lessons are tailored to your comfort, experience level, and desired learning objectives. Lessons can include kayaking fundamentals, technique, and performance skills, wet exits and recoveries, youth safety for sit-on-top kayaks, or whatever your specific needs require. Contact our Programs Manager for more details and to schedule your private lesson.